Paisley or Paisley pattern is a term in English for a design using the buta or boteh, a droplet-shaped vegetable motif of Persian (i.e. Iranian) origin. Such designs became very popular in the West in the 18th and 19th centuries, following imports of post-Mughal versions of the design from India, especially in the form of Kashmir shawls, and were then imitated locally. Resembling a twisted teardrop, the fig-shaped paisley is of Persian (i.e. Iranian) origin, but its western name derives from the town of Paisley, in West Scotland, a centre for textiles where paisley designs were produced. Some design scholars believe it is the convergence of a stylized floral spray and a cypress tree: a Zoroastrian symbol of life and eternity. It is a bent cedar, and the cedar is the tree Zarathustra planted in paradise. The heavenly tree was “bent” under the weight of the Arab invasion and Muslim conquest of Persia. The "bent" cedar is also the sign of strength and resistance but modesty. The floral motif was originated in the Sassanid Dynasty and later in the Safavid Dynasty of Persia (from 1501 to 1736), and was a major textile pattern in Iran during the Qajar and Pahlavi Dynasties. In these periods, the pattern was used to decorate royal regalia, crowns, and court garments, as well as textiles used by the general population. According to Azerbaijani historians, the design comes from ancient times of Zoroastrianism and is an expression of the essence of that religion. 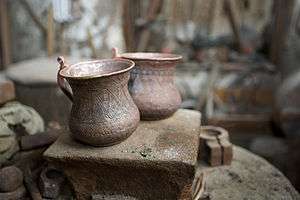 It subsequently became a decorative element widely used in Azerbaijani culture and architecture. The pattern is still popular in Iran and South and Central Asian countries. It is woven using gold or silver threads on silk or other high quality textiles for gifts, for weddings and special occasions. In Iran and Uzbekistan its use goes beyond clothing – paintings, jewelry, frescoes, curtains, tablecloths, quilts, carpets, garden landscaping, and pottery also sport the buta design. In Uzbekistan the most frequently found item featuring the design is the traditional doppi headdress. In Tamil Nadu the manga maalai (mango necklace) with matching earrings is a traditional feature of bharathanatyam dance. It is a prominent design in Kanchipuram saris. It has sometimes been associated with Hinduism. 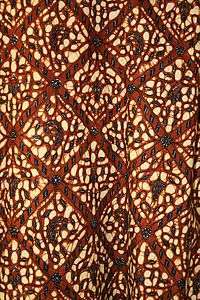 The modern French words for paisley are boteh, cachemire (cashmere; capitalized, "Kashmir") and palme, the latter being a reference to the palm tree, which, along with the pine tree and the cypress tree, is one of the traditional botanical motifs thought to have influenced the shape of the paisley element as it is now known. In Punjabi: ambi, from amb, mango. In Chinese it is known as the "Ham hock pattern" (火腿纹 huotuiwen). In the 19th century European production of paisley increased, particularly in the Scottish town from which the pattern takes its modern name. Soldiers returning from the colonies brought home cashmere wool shawls from India, and the East India Company imported more. The design was copied from the costly silk and wool Kashmir shawls and adapted first for use on handlooms, and, after 1820, on Jacquard looms. From roughly 1800 to 1850, the weavers of the town of Paisley in Renfrewshire, Scotland, became the foremost producers of these shawls. Unique additions to their hand-looms and Jacquard looms allowed them to work in five colors when most weavers were producing paisley using only two. The design became known as the Paisley pattern. By 1860, Paisley could produce shawls with 15 colors, which was still only a quarter of the colors in the multicolor paisleys then still being imported from Kashmir. In addition to the loom-woven fabric, Paisley became a major site for the manufacture of printed cotton and wool in the 19th century, according to the Scotland's Paisley Museum and Art Gallery. The paisley pattern was being printed, rather than woven, onto other textiles, including cotton squares which were the precursors of the modern bandanna. Printed paisley was cheaper than the costly woven paisley and this added to its popularity. The key places of printing paisley were Britain and the Alsace region of France. Paisley became identified with psychedelic style due to a resurgence in the pattern's mainstream popularity leading up the mid and late 1960s. Of particular note is the influence of The Beatles. Consequently, the style was particularly popular during the Summer of Love in 1967. Fender Guitars made a Pink Paisley version of their Telecaster guitar, by sticking paisley wallpaper onto the guitar bodies. Prince paid tribute to the rock and roll history of paisley when he created the Paisley Park Records recording label and established Paisley Park Studios, both named after his 1985 song "Paisley Park". At the 2010 Winter Olympics, Azerbaijan's team sported colorful paisley trousers. Paisley was a favorite design element of architect Laurie Baker. He has made numerous drawings and collages of what he called 'mango designs'. He used to include the shape in the buildings he designed also. Buta (Persian: بته‎‎), (Azerbaijani: Buta) – is an almond-shaped ornament with a sharp-curved upper end. It is broadly famed in Iran, Azerbaijan, Turkey and countries of the Near East. Patterns and ornaments of buta motifs can be found on Azerbaijani rugs, kalaghai and textiles, paintings of decorative-applied arts of Azerbaijan and also in decorations of architectural monuments. “Buta” is a typical detail of Azerbaijani national ornaments. 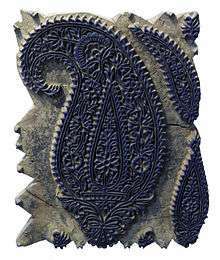 This motif is considered as the most ancient among all national ornaments of Azerbaijan. There are many printed items decorated only with buta. Buta motif was frequently used by Azerbaijani masters. Buta has a lot species and each of them has its own symbolical meaning. 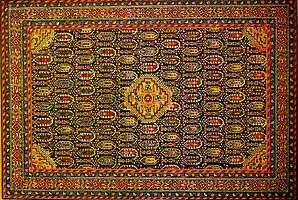 But buta is widely spread in Ganja, where it has become an integral part of carpet ornaments. Buta is displayed in the emblem of the 2012 FIFA U-17 Women's World Cup, which has been held in Azerbaijan. ↑ English Dictionary, Oxford . 1 2 Indian Hand Woven Jacquard Jamavar Shawls, Zanzibar Trading . ↑ Milani, Abbas, The Shah, Macmillan . ↑ "22Kt gold Mango Mala necklace from India on Jewel of the Lotus". Asian art. Retrieved 2013-03-11. ↑ "Traditional Jewels of India". Jewels in India. Retrieved 2013-03-11. ↑ "Blue stones Mango Necklace Temple Bharatanatyam Jewelry". Vadaamalar. 2011-01-08. Retrieved 2013-03-11. ↑ Sarumathi, K (2012-08-12). "M.S. blue, mango motif still in vogue". The Hindu. Retrieved 2013-03-11. ↑ Trends, Desi (2012-06-15). "Jayapradha Red Kancheepuram Bridal Sari | Saree Blouse Patterns". Celebrity saree. Retrieved 2013-03-11. ↑ "Image 14620652". Kanchipuram Silk Saree Stock Photography. Dreams time. 2010-04-24. Retrieved 2013-03-11. ↑ "Sareeslook sarees". Picasa Web Albums. Google. 2009-11-13. Retrieved 2013-03-11. ↑ "Image of the Mankolam Design". Sacred Symbols of Hinduism. About. 2012-04-10. Retrieved 2013-03-11. ↑ Sharon B (Aug 29, 2006), A prune or a pickle: the process of working up a small design, Wordpress, retrieved February 3, 2008 . ↑ Zaman Niaz (1993). The Art of KANTHA Embroidery (Second Revised ed.). Dhaka, Bangladesh: The University Press Limited. p. 82. ISBN 984-05-1228-5. ↑ "The Prohibition Years, 1686–1759", Le Musée de l'Impression sur Etoffes [The Museum of Printed Textiles], retrieved February 3, 2008 . 1 2 3 Andrews, Meg, Beyond the Fringe: Shawls of Paisley Design, Victoriana, retrieved February 3, 2008 . Heavily illustrated history of paisley fashions. ↑ "Paisley Museum and Art Gallery", About Britain . 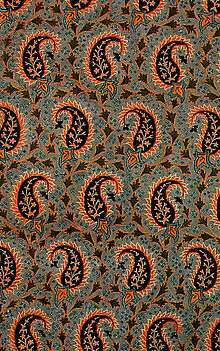 ↑ "Printed 'Paisley' in the 19th Century", Le Musée de l'Impression sur Etoffes [The Museum of Printed Textiles], retrieved February 3, 2008 . ↑ "Vancouver 2010: The Olympics of the Silly Pants", Tonic . 1 2 3 Н. Самгнна. (1995). Ковры типа Фахралы. 56. Сообщения Государственного Эрмитажа: Искусство. p. 59. ↑ В. Лобачев. (1975). Магия подзаголовка. Книга. p. 190. 1 2 Г. А. Гулиев. (1964). Об азербайджанской набойке. Советская этнография: Издательство Академии наук. p. 134. С. Ашурбейли «Новые изыскания по истории Баку и Девичьей башни» Альманах искусств 1972 г, С.Ашурбейли «О датировке и назначении Гыз галасы в крепости» Элм. 1974 г.
Irwin, John (1973), The Kashmir Shawl, Victoria and Albert Museum, ISBN 0-11-290164-6 . Levi-Strauss, Monique (1987), The French Shawls, Dryad, ISBN 0-85219-759-4 . Reilly, Valerie (1987), The Paisley Pattern: The Official Illustrated History, Glasgow: Richard Drew, ISBN 0-87905-317-8 . 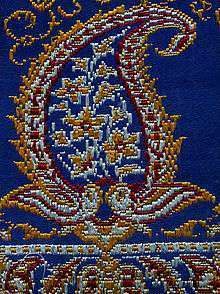 Wikimedia Commons has media related to Paisley pattern.